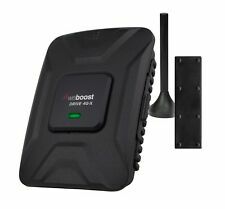 SH W CELL Cell Phone Signal Booster PLX-BV70. Shipped with USPS First Class Package. Appears to be all there. May have been installee at one time. I am unsure. Works with 3G WCDMA 2100MHz cell phone service providers. It supports 3G, WCDMA, GSM2100MHz and any wireless operator in the frequency range of 1920- 1990MHz and 2110-2180MHz. The directional indoor antenna is built-in the cradle, you can take your phone on hand or put it on the cradle when making the phone call. Overview: A mobile phone signal repeater provides the ultimate solution in any area where cellular communications can not work well due to leak of signals. The repeater device features easy installation & operation. It could also improve indoor electromagnetism environments, protract cellular battery life and reduce radiation of cellphones. A mobile phone repeater is ideal for house, home, office use. 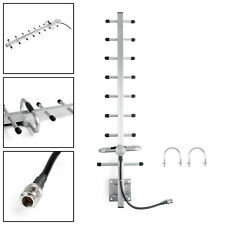 Characteristic Specification Downlink Uplink Frequency Range 869-894MHz 824-849MHz Max Output Power 2.0W Repeater Gain 80 dB Outdoor Yagi Antenna Gain Max. 11 dB Indoor Wall Antenna Gain Max. 8 dB Repeater Coverage Up to 200 M² Power Supply AC 110 / 220V Type of joint F type female connector Impedance 50Ω Input Power AC 110V, 50Hz Working temperature -10℃ - 60℃ Package include : 1 x CDMA980 C.
Booster is in good working condition. Wilson Electronics 4G Cell Signal Booster for your Office or Home "DBpro4G"
DGPro4g Gain Cellular Signal Booster. - Inside Panel Antenna. -Outside Directional Antenna. Wilson Cell Phone Signal Booster 806215 New in Box! Wilson Cell Phone Signal Booster. Compatible Verizon wireless devices with active service plan. 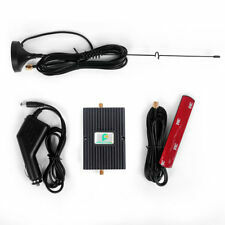 Car Booster GSM 850mhz Cell Phone Boosters for RV Car Truck. Compatible CarrierCarrier works on 850Mhz. It is best used in the following applications Standard Supported: CDMA, WCDMA, GSM, EDGE, TDMA and AWS etc.